One of the most striking findings from the MAA’s survey of university mathematics departments undertaken this past spring (see last month’s column) is the almost universal recognition that current practice in the precalculus through single variable calculus sequence needs to be improved. Many such efforts are now underway, but many of them lack understanding of how institutional change occurs as well as recognition of the importance of this understanding. Much of the literature on institutional change lies too far from the contexts or concerns of mathematics departments to be easily translatable, but an important paper appeared a little over a year ago in the Journal of Engineering Education that provides an insightful framework for understanding change in the context of undergraduate STEM education: “Increasing the Use of Evidence-Based Teaching in STEM Higher Education: A Comparison of Eight Change Strategies” by Borrego and Henderson (2014). This paper takes the framework distilled by Henderson, Beach, and Finkelstein in 2010 and 2011 from their literature review of change strategies and applies it to eight different approaches to bringing evidence-based teaching into the undergraduate STEM classroom. This short column cannot do justice to their extensive discussion, but it can perhaps whet interest in reading their paper. Henderson, Beach, and Finkelstein have identified two axes along which change strategies occur (Table 1): those whose focus is on changing individuals versus those that focus on changing environments and structures, and those that they describe as prescribed, meaning that they try to implement specific solutions, versus those they describe as emergent, meaning that they attempt to foster conditions that support local actors in finding their own solutions. This results in the four categories shown in Table 1. Table I: Change theories mapped to the four categories of change strategies. The italicized text lists two specific change strategies for each of the four categories. Reproduced from Borrego and Hnderson (2014). Within each of the four categories, they identify two strategies that have been used. For example, under a prescribed outcome focused on individuals, Category I, they identify Diffusion and Implementation as two change strategies. Diffusion describes the common practice of developing an innovation at a single location and then publicizing it in the hope that others will pick it up. Implementation involves the development of a curriculum or specified set of practices that are intended to be implemented at other institutions. For each of the eight change strategies, they describe the underlying logic of how it could effect change, describe what it looks like in practice, and give an example of how it has been used, accompanied by some assessment of its potential strengths and weaknesses. Diffusion, in particular, is very common and is known to be capable of raising awareness of what can be done, but it often runs into challenges of incompatibility together with a lack of support for those who would attempt to implement it. At the opposite corner are the emergent strategies that focus on environments and structures. Here Borrego and Henderson consider Learning Organizations and Complexity Leadership Theory. Learning organizations have emerged from management theory as a means of facilitating improvements. They involve informal communities of practice that share their insights into what is and is not working, embedded within a formal structure that facilitates the implementation of the best ideas that emerge from these communities. In management-speak, it is the middle-line managers who are the key to the success of this approach. In the context of higher education, these middle-line managers are the department chairs and the senior, most highly respected faculty. The effectiveness of Learning Organizations resonates with what I have seen of effective departments. They require an upper administration that recognizes there are problems in undergraduate mathematics education and are willing to invest resources in practical and cost- effective means of improving this education, together with faculty in the trenches who are passionate about finding ways of improving the teaching and learning that takes place at their institution. The faculty need to be encouraged to form such communities of practice, sharing their understanding and envisioning what changes would improve teaching and learning. Some of the best undergraduate teaching we have seen has been built on the practice of regular meetings of the instructors for a particular class. The role of the chair and senior faculty is one of encouraging the generation of these ideas, providing feedback and guidance in refining them, and then selling the result to the upper administration, conscious of how it fits into the concerns and priorities of deans and provosts. Throughout this process, it is critical to have access to robust and timely data on student performance for this class as well as for the downstream courses both within and beyond the mathematics department. Complexity Leadership Theory is based on recognition of the difficulties inherent in trying to change any complex institution and calls on the leadership to do three things: to disrupt existing patterns, to encourage novelty, and to make sense of the responses that emerge. Borrego and Henderson could not find any examples of Complexity Leadership Theory within higher education, but, as I interpret this approach as it might appear within a mathematics department, it speaks to the responsibility of the chair and leading faculty to draw attention to what is not working, to encourage faculty to seek creative solutions to these problems, and then to shape what emerges in a way that can be implemented. In many respects, it is not so different from Learning Organizations. The strategies of Category IV highlight the key role of the departmental leadership, which must involve more than just the chair or head of the department. In their discussion, Borrego and Henderson emphasize that they are not suggesting a preference for any of these categories, although they do note that Category I is the most common within higher education and Category IV the least. My own experience suggests that the strategies of Category IV have the greatest chance of making a lasting improvement. Nevertheless, anyone seeking systemic change will need to employ a variety of strategies that span all of these approaches. Their point is that anyone seeking change must be aware of the nature of what they seek to accomplish and must recognize which strategies are best suited to their desired goals. M. Borrego and C. Henderson. 2014. Increasing the use of evidence-based teaching in STEM higher education: A comparison of eight change strategies. Journal of Engineering Education. 103 (2): 220–252. C. Henderson, A. Beach, N. Finkelstein. 2011. Facilitating change in undergraduate STEM instructional practices: An analytic review of the literature. Journal of Research in Science Teaching. 48 (8): 952–984. C. Henderson, N. Finkelstein, A. Beach. 2010. Beyond dissemination in college science teaching: An introduction to four core change strategies. Journal of College Science Teaching. 39 (5): 18–25. Special Notice: The MAA Notes volume summarizing the results of Characteristics of Successful programs in College Calculus (NSF #0910240), Insights and Recommendations from the MAA National Study of College Calculus, is now available for free download as a PDF file at www.maa.org/cspcc. This is the last of my columns on Calculus at Crisis. In the first three, from May, June, and July, I explained why we can no longer afford to continue doing what we have always done. Last month I described some of the lessons that have been learned in recent years about best practices with regard to placement, student support, curriculum, and pedagogy. Unfortunately, as those who seek to improve the teaching and learning of introductory mathematics and science have come to realize, knowing what works is not enough. There are many barriers to change, both individual and institutional. Lack of awareness of what can be done is seldom one of them. In recent years, leaders in physics and chemistry education research, especially Melissa Dancy, Noah Finkelstein, and Charles Henderson have studied these barriers and begun to translate insights from the study of how institutional change comes about in order to assist those who seek to improve post- secondary science, mathematics, and engineering education. One of the best short summaries describing specific steps toward achieving long-term change is Achieving Systemic Change, a report issued jointly by the American Association for the Advancement of Science (AAAS), the American Association of Colleges and Universities (AAC&U), the Association of American Universities (AAU), and the Association of Public and Land-grant Universities (APLU) that I discussed this past December. Its emphasis on creating supportive networks within and across institutions is reflected in our own findings in the MAA’s calculus study. There has always been lively interest from individual faculty members in improving mathematics education. Heroic efforts have often succeeded in moving the dial, but without strong departmental support they are not sustainable. As I have explained over the past months, deans, provosts, and even presidents now realize that something must be done. I have yet to meet a dean of science who is not willing—usually even eager—to fund a proposal from the mathematics department for improving student outcomes provided it is concrete, workable, and cost-effective. (Just hiring more mathematicians does not cut it.) The key link between eager faculty and concerned administrators is the department chair, together with the senior, most highly respected faculty. Without their support and cooperation, no lasting improvements are possible. The department chair is essential. This is the person who can take an enthusiastic proposal and massage it into a workable plan whose benefits are understandable to the upper administration. This is the person who can take a request from the dean, understand the resources that will be required, and find the right people to work on it. Unfortunately, appointment as chair does not automatically confer such wisdom. Part of what is needed is an understanding of what is being done at comparable institutions, how it is being implemented, what is working or failing and why. This is where the mathematical societies have an important role to play. AMS does this through its Information for Department Leaders, the work of the Committee on Education, and its blog On the Teaching and Learning of Mathematics. The MAA’s CUPM, CTUM, and CRAFTY committees provide this information through publications, panels, and contributed paper sessions. SIAM, ASA, and AMATYC also embrace this mission. Common Vision began this year as an effort to coordinate these activities across the five societies. But a supportive department chair is not enough. The lasting power center in any department consists of senior faculty who are highly respected for their research visibility. The most successful calculus programs we have seen in the MAA study Characteristics of Successful Programs of College Calculus involved some of these senior faculty in an advisory capacity: monitoring the annual data on student performance, observing occasional classes, mentoring graduate students not just for research but also for the development of teaching expertise, and providing encouragement and a sounding board to those—usually younger faculty—engaged in trying new methods in the classroom. It will be the chair’s responsibility to identify the right people for this advisory group, but once it is in existence it can help ensure that future chairs are sympathetic to these efforts. Finally, any mathematics department seeking to improve undergraduate education must remember that it is not alone within its institution. 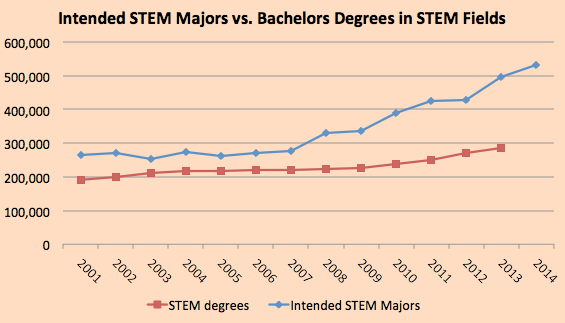 Similar efforts are underway in each of the sciences as well as engineering. Deans and provosts can help by formally recognizing those who serve in these senior roles across all STEM departments and encouraging links between these groups of faculty. They can draw on support and advice from consortia of colleges and universities such as AAU, APLU, and AAC&U, as well as multidisciplinary societies and consortia such as AAAS and the Partnership for Undergraduate Life Science Education (PULSE), all of whom are working to promote networks of educational innovation that cross STEM disciplines. Joining with other departments within the institution can dispel the perception of mathematics as insular and unconcerned with the needs of others as it strengthens individual departmental efforts. All STEM departments are facing similar difficulties. This crisis presents us with an exceptional opportunity to work across traditional boundaries. The need to teach ever more students, who often bring weaker preparation, using fewer resources. The fact that most Calculus I students have already studied calculus in high school (this past spring 424,000 students took an AP Calculus exam, an increase of 100,000 over the past five years). The pressures from the client disciplines to equip their students with the mathematical knowledge and habits of mind that they actually will need. As I have traveled this country to meet with mathematics departments, I have seen that there is a general recognition on the part of chairs, deans, provosts, and occasionally even presidents that the past solutions for calculus instruction are no longer adequate. I am encouraged by the fact that the mainstream calculus sequence is so central to all of the STEM disciplines that, even in these tight budget times, many deans and provosts can find the resources to support innovative programs if they can be convinced these efforts are sustainable, cost-effective, and will actually make a difference. There are four basic leverage points for improving the calculus sequence so that it better meets at least some of these pressures: placement, student support, curriculum, and pedagogy. We know a lot about what does work for each of these. Much of this knowledge—relevant to the teaching of calculus—is contained in the new MAA publication Insights and Recommendations from the MAA National Study of College Calculus, the report on a five-year study of Characteristics of Successful Programs in College Calculus undertaken by the MAA with support from NSF (#0910240). I briefly summarize some of the insights. Placement. Placement can have a huge impact on student success rates. However, given the demands of the client disciplines and the fact that remediation is usually of doubtful value (see The Pitfalls of Precalculus), just tightening up the requirements for access to calculus is unlikely to make a dean or provost happy. We do have evidence of the effectiveness of adaptive online exams such as ALEKS that probe student understanding to reveal individual strengths and weaknesses, especially when combined with tools that can help students address specific topics on which they need refreshing. But there is no one placement exam or means of implementation that will work for all institutions. Further elaboration on what we have learned about placement exams can be found in Chapter 5, Placement and Student Performance in Calculus I, of Insights and Recommendations. Student Support. Programs modeled on the Emerging Scholars Programs can be very effective for supporting at-risk students (see Hsu, Murphy, Treisman, 2008). Tutoring centers are virtually universal, but not always as useful as they could be. The best we have seen put thought into the training of the tutors, require classroom instructors to hold some of their office hours in the center, and are located conveniently with a congenial atmosphere that encourages students to drop in to study or work on group projects even if they do not need the assistance of a tutor. In addition, quick identification and effective guidance of students who are struggling with the course is essential. More on these points can be found in Chapter 6, Academic and Social Supports, of Insights and Recommendations. Curriculum. This is the toughest place at which to apply leverage. Most faculty are fine with changes to placement procedures and support services but are appalled at the very thought of touching the curriculum. The pushback against the Calculus Reform movement of the early 1990s was strongest where curricular changes were suggested. Yet this is where we are most likely to be successful in meeting the needs of students who studied calculus in high school, and it must be part of any strategy for meeting the needs of the client disciplines. Research coming out of Arizona State University and other centers of research in undergraduate mathematics education has revealed the basic wisdom of many of the Calculus Reform curricula that approached calculus as a study of dynamical systems. Curricular materials are now being developed that have a much firmer basis in an understanding of student difficulties with the concepts of calculus (for an example, see Beyond the Limit). Pedagogy. Another aspect of the Calculus Reform movement that was poorly received was the emphasis on active learning. The evidence is now overwhelming that active learning is critical, especially important for at-risk students and essential for meeting the needs of the client disciplines. We have learned a lot in the intervening quarter century about how to do it well and cost-effectively, and this is one of the places where new technologies can be particularly helpful. There are now many models for implementation of active learning strategies, spanning classrooms of all sizes, student audiences at varied levels of expertise, and faculty with different levels of commitment to changing how they teach (see Reaching Students). Evidence for the effectiveness of active learning and recommendations of strategies for implementing it can be found in Donovan & Bransford, 2005; Freeman et al., 2014; Fry, 2014; Kober, 2015; and Kogan & Laursen, 2014. The bottom line is that we do have knowledge that can help us face this crisis. There is no universal solution. Each department will have to find its own way toward its own solutions. But it need not stumble alone. As I will explain next month in the fifth and final column in this series, making meaningful and lasting change requires networks of support both within and beyond the individual department. Here also our knowledge base of what works and why has expanded in recent years. Bressoud, D., Mesa, V., Rasmussen, C. (eds.) (2015). Insights and Recommendations from the MAA National Study of College Calculus. MAA Notes. Washington, DC: Mathematical Association of America (to be available August, 2015). In my last years at Penn State, I worked with faculty in the College of Engineering on issues of undergraduate education. They had two complaints about the mathematics department. First, we were failing too many of their students. Second, the ones we passed seemed incapable of using the mathematics we presumably had taught them when they got to their engineering classes. Chief among their specific gripes was an inability among their students to read a differential equation, to understand its assumptions of the relationships among the quantities being measured. From the current ABET (Accreditation Board for Engineering and Technology) Criteria for Accreditation, all of the references to mathematics under Curriculum talk about “creative applications,” building “a bridge between mathematics and the basic sciences on the one hand and engineering practice on the other,” and the use of mathematics in the “decision-making process.” As ABET moves into the criteria for specific programs, again the emphasis is entirely on the ability to apply knowledge of mathematics, not on any list of techniques or procedures. These examples can be multiplied in other client disciplines. What we see is a universal need for students to be able to use mathematical knowledge in the context of their own disciplines. In the case of calculus, the challenge is to understand it as a tool for modeling dynamical systems. This is why calculus is required by so many disciplines. But this is an understanding of calculus that is achieved by very few of our students because their focus has been narrowed down to learning how to solve the particular problems that will be on the next exam. None of this disconnect between what we teach in calculus and the needs of the client disciplines is new. It now rises to the level of a force that is bringing us to crisis because these client disciplines are themselves under the same increased pressure to have their students succeed. There may have been a time when there was a sufficiently rich pool of potential engineers that we could afford the luxury of allowing the mathematics department to filter out all but the most talented, the ones who would succeed in spite of how we taught them. If it ever existed, that time has passed. Our client disciplines now have higher expectations for what and how we teach their students. I have yet to find physicists, engineers, or computer scientists who want to take over our calculus instruction. They have better things to do. But some have been forced to do so, and others are contemplating undertaking it as a necessary correction to mathematical instruction that is not meeting their needs. This completes my triad of forces that constitute the reason we are at crisis. It is the nature of a crisis that the solution is not readily apparent. Nevertheless, there are actions that can be taken to improve the situation. Next month, I will explore the first of these: drawing on knowledge of best practices for effective teaching and learning. I began this series last month by explaining how recent economic conditions are sending more students into the primary STEM fields (engineering and the physical, biological, mathematical, and computer and information sciences) while constricting the resources available to meet the needs of educating them. This is just one of a triad of phenomena that are pushing college calculus toward crisis. This month, I will discuss the second of these forces: the rush to calculus. Nothing illustrates the relentless growth of high school calculus better than the graph of the number of AP Calculus exams taken each year (Figure 1), surpassing 400,000 in 2014. According to NCES data , 53% of the students who study calculus in high school take an AP Calculus exam, implying that roughly 750,000 U.S. high school students studied calculus this past year. By comparison, this past year only 250,000 students took their first mainstream calculus class at a 2- or 4-year college or university . Figure 1: Total AP Calculus exams and fall enrollments in mainstream Calculus I. Sources: The College Board and CBMS Statistical Abstracts. What happens to the students who study calculus in high school? We know from the MAA study Characteristics of Successful Programs in College Calculus that about one- third of them retake Calculus I when they get to college. Based on AP scores and common policies for granting credit, roughly 200,000 students accept credit and/or advanced placement for their high school work. From a limited study , a clear majority of these students, probably three-quarters or more, do continue on to further courses that build on calculus. 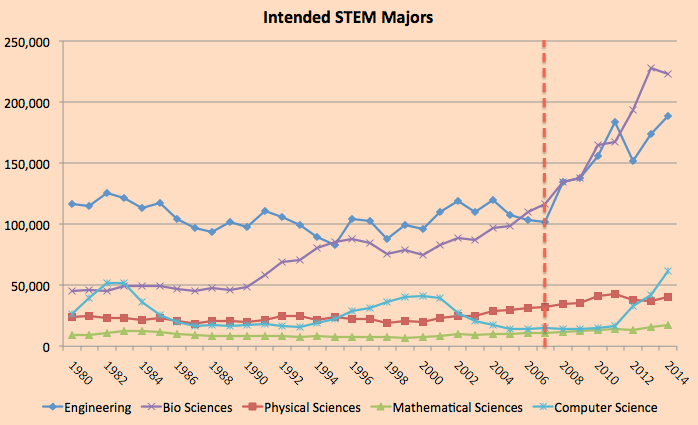 All of these patterns intensify at research universities and elite colleges, where at least 70% of Calculus I students are retaking a course they have already seen in high school, and large numbers of students heading for math-intensive majors skip over Calculus I. The result has been a dramatic change in the make-up of Calculus I. At most colleges and universities, it makes little sense to teach this course as if students are encountering calculus for the first time; few of them are. It also makes little sense to teach this course as if the students are heading into the mathematical or physical sciences. Nationwide, only 6% of Calculus I students intend such a major . Finally, it makes little sense to teach this course as if this is where we see our best-prepared students. This last point is clear if we consider how many of the best-prepared students skip Calculus I, but it also is a consequence of what the rush to calculus has done to the middle and high school curricula in mathematics. In fall 2014 there were just over 1.6 million full-time first-year students enrolled in 4- year undergraduate programs in the U.S. . Assuming that most of the 750,000 who take calculus in high school are traditional college-bound students who will enroll as full- time students in 4-year programs, these high school calculus students will constitute 40–45% of traditional first-year college students. The result is a common belief among parents, guidance counselors, and administrators that every college-bound student should, if at all possible, study calculus before high school graduation. I hear this from college students whose reason for taking calculus in high school was that it was expected of their peer group, and I hear it especially from high school teachers who complain of the tremendous pressure they are under to expand calculus classes and admit students they know are not ready for it. Because high school calculus by itself has become such common coin, those students who aspire to an elite college or university try to take calculus, preferably BC Calculus, before 12th grade. Figure 2 shows the exceptional growth in the number of students who take an AB or BC Calculus exam before grade 12. Figure 2: Number of AP Calculus exams taken by students in grade 11 or earlier. Source: The College Board. We do not know the full effect of this movement of calculus into ever earlier grades, but there is strong anecdotal evidence from teachers at both the high school and university level that many of these students are short-changing their preparation in middle and high school mathematics to join the fast track to calculus. Again anecdotally, this appears to be a significant problem when students attempt a math-intensive major where weaknesses in precalculus material can be disastrous. We can deplore the rush to calculus in high school, but the forces that are sustaining it are formidable. We have neither the authority nor the certain knowledge that would enable us to halt or reverse it. For the foreseeable future, we will have to live with it. Just in the past ten years, the preparation and aspirations of our college calculus students have shifted significantly. We cannot afford to assume that curricula and methods of instruction that were sufficient for the past will be adequate for the future. By “mainstream” we mean a calculus course that can be used as part of the pre- requisite stream for more advanced mathematics courses. It usually does not include business calculus, but may or may not include calculus for biologists. The figure of 250,000 is an estimate based on data from the CBMS Statistical Abstracts and the MAA study Characteristics of Successful Programs in College Calculus. Approximately 500,000 students began mainstream Calculus I at the post-secondary level at some point in the past year, and roughly half of them had studied calculus in high school. Morgan, K. (2002). The use of AP Examination Grades by Students in College. Paper presented at the 2002 AP National Conference, Chicago, IL. Source: MAA National Study of College Calculus, www.maa.org/cspcc. The National Academies have just released a report that should be of interest to readers of this column: Reaching Students: What research says about effective instruction in undergraduate science and engineering. It is based on their earlier report, Discipline-Based Education Research: Understanding and Improving Learning in Undergraduate Science and Engineering (the DBER Report), which was the subject of my Launchings column in December 2012, Mathematics and the NRC Discipline-Based Education Research Report. The new report illustrates the insights and recommendations from DBER with current examples and presents practical suggestions for improving classroom instruction. Before I get into the many things I like about this report, I will start with its one glaring fault: It completely ignores undergraduate mathematics education. Like the DBER Report itself, it reads as if mathematicians have never thought about effective classroom practice. Based as it is on the DBER Report, this is perhaps not surprising. It is still disappointing. These call-out illustrations are interspersed among pointed and helpful discussion of the issues faced by those who are working to improve undergraduate STEM education. It starts with the basics: how to find like-minded colleagues, how to find resources, and the benefits of joining a learning community. This report discusses the role of lecturing, both its strengths and its weaknesses. More importantly, it talks about strategies for making lectures more interactive. It looks at assessment as more than measuring what questions students can answer, describing how to use it—especially student writing—to understand student reasoning, misconceptions, and misunderstandings. It also deals with the challenges of changing one’s pedagogy and the obstacles that we all face, recognizing the difficulty in finding the time and energy required to adapt one’s approach to teaching. The advice includes: start with whatever is comfortable for you, use proven materials that others have developed, take advantage of the support that is available (there are many small grants specifically designed to ease the adoption of such practices ), and share the effort with interested colleagues. The report also tackles the issue of coverage, one of the most frequently cited reasons for sticking with lectures. As the report accurately states, “What really matters is how much content students actually learn, not how much content an instructor presents in a lecture.” (p. 160) Moreover, as I have found in my classes, helping students learn how to think about mathematics, how to read it, how to wrestle with it, how to tackle unfamiliar and challenging problems, means helping them learn how to learn it on their own. As we succeed in these goals, there will much content that can be assigned to them to learn through reading or online resources rather than by taking up precious contact time. Helping students develop this kind of expertise is difficult, but we know that active learning approaches are much more effective than simply watching an expert produce the solution in a flawless flow. Start small with the changes that make the most sense and are easily implemented. Establish challenging goals for what students will learn and use them to guide both your instructional strategies and your assessments. Draw on the research, materials, and support structures that are already available. I hope that this report will sit in the reading room of every math department and at hand for every mathematician who cares about teaching. One example of a source of small grants for the teaching of undergraduate mathematics is the Academy of Inquiry Based Learning, www.inquirybasedlearning.org. Ambrose, S.A., Bridges, M.W., DiPietro, M., Lovett, M.C., and Norman, M.K. (2010). How Learning Works: Seven research-based principles for smart teaching. San Francisco, CA: Jossey-Bass. National Research Council. (2005). How Students Learn: Mathematics in the Classroom. M.S. Donovan and J.D. Bradford, Editors. Washington, DC: The National Academies Press. Despite this month’s title, I have refrained from writing about MOOCs, Massive Open Online Courses, in this column before now. The initial burst of interest always seemed overdone to me. Now that the enthusiasm has waned, we are beginning to see the emergence of meaningful information about when and how they can be useful. As I argued in my co-authored piece in the AMS Notices, Musings on MOOCs , they do seem to hold promise as a source of supplementary material that enables flipped classes, supplementary instruction, alternate approaches, or opportunities for exploring topics that extend beyond the course syllabus. Two questions immediately emerge: How hard is it to take advantage of these materials? Do students actually benefit? This past summer, Rebecca Griffiths and her team at Ithaka S+R, an academic consulting and research service, released Interactive Online Learning on Campus , its study of the use of hybrid MOOCs within the University System of Maryland. Hybrid MOOCs are face-to-face classes for which instructors draw on online courses, in this case developed by Coursera or the Open Learning Initiative, to supplement their own instruction. Griffiths et al. conducted seven side-by-side studies, direct comparisons of the same courses taught with and without these online supplemental materials, and ten case study investigations of courses that were only taught with supplemental materials derived from MOOCs. The side-by-side comparisons are of greatest interest to me because of the usefulness of direct comparisons and because these courses included STEM subjects: three sections of introductory biology and one each of pre-calculus, statistics, and computer science, plus a course in communications. In answer to the first question—How hard is it to incorporate material from these online courses?—the answer is hard, but probably will become easier when repeated. Griffiths et al. found that self-reported instructor time spent selecting the materials and preparing how they would incorporate them into their hybrid course had a median of 68 and a mean of 144 hours, roughly two to four weeks. The variation was tremendous, from only one full-time week to an entire summer. Most of this is, almost certainly, a one-time investment. For some hybrid courses, face time was reduced by as much as 50%. For others, there was no reduction in face time. Once the start-up time is invested, there appears to be potential for some time—and therefore cost—savings, although it would be modest at best. The biggest question is whether this improved student outcomes. For the most part in the side-by-side comparisons, there was little difference in pass rates or student performance on a common post test. One biology section had a substantially and significantly better pass rate for the hybrid course, but the other two hybrid biology sections had slightly lower (though not statistically significantly lower) pass rates than the sections with which they were paired. With two exceptions, results on the post tests were indistinguishable between hybrid and non-hybrid courses. Those exceptions were the biology section with the high pass rate and the pre-calculus class. In both of these cases, the hybrid classes posted substantially higher post test results that were significant at p < 0.001. Griffiths et al. also looked at pass rates and post test results by key subgroups involving race, gender, socio-economic status, and SAT scores. Averaging across all of the side-by-side comparisons for each of the subgroups, pass rates and post test results improved with the hybrid courses, although none of the pass rate differences were significant at p < 0.01. However, several of the post test comparisons were. Although all students saw gains from the hybrid approach, the greatest gains were to White and Asian students, females, and those with parental income between $50,000 and $100,000, at least one parent with a BA, and combined SAT scores above 1000. There were other factors that came into play. Students preferred the traditional course format and felt that they learned more from it, although they did prefer to do their homework assignments, quizzes, and exams online. Technical glitches did arise in the hybrid courses and may have been a factor in student dislike of online instruction. One of the most intriguing differences was in how much time students spent on the course outside of classtime. Here the effects were in opposite directions for: under-represented minorities (URM) versus non-URM, low income versus high income, first generation college student versus not first generation, SAT scores below 1000 versus SAT score above 1000. In all cases, the first group saw a decrease in time spent outside of class with the hybrid course, the second group an increase. It may be that online materials allowed students in these traditionally under-represented subgroups to make more efficient use of their time, thus needing to spend less time. But that is a hypothesis that would require study. On its face, this distinction is troubling. This past September, The Chronicle of Higher Education published an article with which I strongly resonated, “Want to help students learn? Try confusing them.” . It described an experiment in which two groups of students were each presented with a video of a physics lecture. The first lecture was straightforward, using simple animations and clear explanations. The second involved a tutor and a student in which the student struggled to understand the concepts and the tutor provided leading questions but no answers. Coming out of the videos, students found the first to be clear and easy to understand, the second very confusing. Yet when later tested on this physics lesson, students who had seen the second video demonstrated far more learning than those who had seen the first. This illustrates the problem with so much of standard instruction, especially in undergraduate mathematics. The ideas have become so polished over decades if not centuries, and we who teach this material understand its nuances so thoroughly, that what we present glides easily past our students without opportunity to grasp its true complexities. For learning to take place, students must engage and wrestle with the concepts we want them to understand. I am not advocating confusion for confusion’s sake. 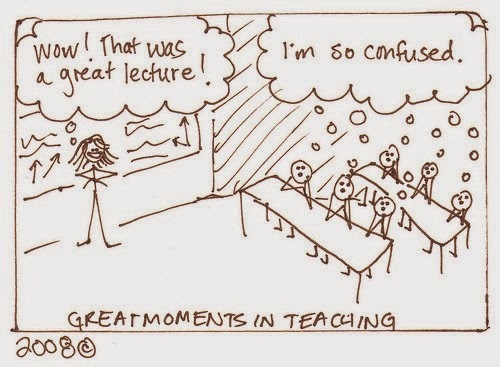 As Courtney Gibbon’s cartoon illustrates, a polished lecture can also be very confusing, and not in a good way. Confusion is most productive when it provides a focus for personal investigation. An example of positive confusion is the cognitive dissonance produced when student expectations confront convincing evidence that they are wrong. My prime example of this is George Pólya’s Let Us Teach Guessing (see my Launchings column Pólya's Art of Guessing). I like to think of this as “gritty” mathematics rather than confusing mathematics. One of my favorite examples from personal experience was a Topics in Real Analysis course that I taught in Spring 1997 using Thomas Hawkins’ doctoral dissertation, Lebesgue’s Theory of Integration: Its Origins and Development, as the text. My experience teaching that course laid the foundation for my textbook A Radical Approach to Lebesgue’s Theory of Integration. Back in 1998, I wrote a paper about this experience, “True Grit in Real Analysis.” I never published it, but I still like it, and as a New Year’s gift to readers, I offer a link to that paper.